For a while, he was a nightly, go-to sensation on American talk shows. On the day of his death, however, there was no mention of former Toronto mayor Rob Ford on shows headlined by Jimmy Kimmel, Jimmy Fallon, Conan O’Brien, Seth Meyers or Trevor Noah. 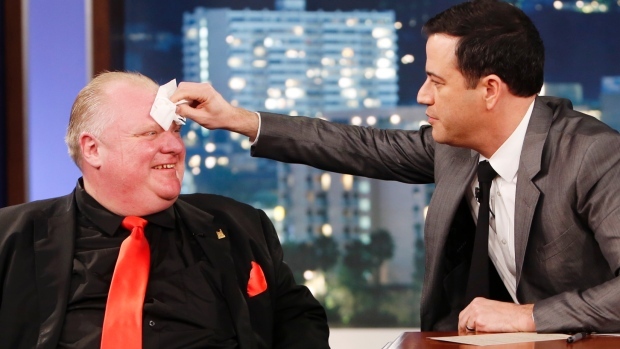 Kimmel had Ford on as a guest two years ago this month. The former mayor tossed T-shirts into the studio audience before sweating through a segment where he stood watching one unflattering video after another. By the time of his Kimmel appearance in Los Angeles, Ford had already admitted to smoking crack cocaine while in office. “You love being mayor, don’t you?” Kimmel asked in the third segment. “I wasn’t elected to be perfect, Jimmy,” said Ford. There were no jokes or even a respectful mention, however, in any of the late night monologues. Ford did die on a busy day. There were U.S. primaries to make fun of, as well as U.S. president Obama’s historic trip to Cuba, plus the deadly attacks in Belgium. Kimmel’s first guest was Democratic presidential candidate Senator Bernie Sanders. Noah, host of The Daily Show, got serious at the end of his program, offering condolences to the people of Belgium. Larry Wilmore, host of The Nightly Show, opened his show with a similar nod to the Belgium airport attack. All of the hosts resumed mocking the politician who long ago eclipsed Ford as late night comedy fodder, Donald Trump.